My husband, Ehud, and I were married in India fifteen years ago, on February 22, 1996. During our traditional Hindu wedding ceremony, we walked around a sacred fire seven times and took a vow that for seven lifetimes we would give each other nourishment, strength, prosperity, happiness, progeny, long life, harmony, and understanding. These vows were pledged according to Vedic tradition, with priests, family and friends, and the fire god Agni as witnesses. Although no prenuptial agreements and marriage contracts were signed to authenticate the process, our vows are binding forever; according to Hindu tradition, there is no way to break these sacred vows--not just in this lifetime, but in seven lifetimes. As the seriousness of our commitment sank in, I felt more confident that I had made a choice in which my mind and heart were fully engaged, and that I was going to honor my choice. How Ehud felt, and how Ehud and I felt together as a team, only time would tell. After this rigorous wedding ceremony (and the hectic preparation that preceded it), we were relaxing surrounded by friends and relatives receiving compliments, blessings, hugs, kisses, and presents. Basking in the warmth of our new relationship, we smiled nonstop -- there was so much to be happy about. Just then, our friend Mrs. Lakshmi, Dr. Ramakrishnan's mother, stopped in to greet us. She was in her late seventies, had raised many children and grandchildren, and had lived her entire adult life with her husband; they had been married for at least fifty years. She looked at Ehud and me with a tiny smile and asked us, "How are you?" It was as if we'd been waiting for this very question. "Great! We are very, very happy," we replied, almost in unison. Mrs. Lakshmi didn't buy that. "You are married for less than an hour right now. It is so new everything looks rosy. You declare loudly that you are happy. Tell me this same thing after you have clocked fifteen years together. After all those years, i you can still say loud and clear that you are happy, I will accept that you have a good marriage. Right now, it is too soon to tell. You have not tasted reality yet. You have not set foot outside your country and begun missing her yet," the older woman said, all in one breath and in a hushed tone. Her wizened, wrinkled face was certain evidence that she had lived a real life and was still living it. Her cynicism was clearly born from experience. I was shaken by her blunt and direct denial of our happy state, but also intrigued by her cheekiness at trying to bring the blissful newlyweds down to earth with an uninvited dose of reality. I almost felt as if she were saying, "What are you so happy about? You know, one of you could die right now." Although it is true that freaky things do happen, it is not very tactful or diplomatic to impart wisdom about the ephemeral nature of happiness to newlyweds. By nature, happiness is transient. So long as people are in a happy state, why burst their bubble by reminding them that happiness doesn't last forever? Why not let life be the ultimate teacher? Because I was not ready to spoil my composure by entering into an argument, I refrained from responding to Mrs. Lakshmi. However, at that very moment, I resolved to study the state of happiness for the rest of my life and do a periodic evaluation about how we were doing. This older woman had lived a full life. She was talking, though a bit out of place, from her actual experience of having seen numerous cases of newly wedded bliss shatter to smithereens as a young couple began their daily life together. Even though her comment did not exactly suit the mood of the moment, it had truth in it and was based on her practical experience of the real world, so I couldn't brush it aside as a "lalala" from an embittered old hag. Her comment also reminded me, in a moment of sublime happiness, that seeking happiness is a fundamental and universal trait of the human mind. We spend an entire lifetime seeking happiness, though it is known only too well that happiness, like every other condition of the human mind and every other emotional state, is transient. To maintain happiness permanently in our marriage, I would have to work hard and hope I would succeed much of the time, but there was no guarantee. No time-tested formula was secretly given to me on my wedding day. I knew I had to reinvent the wheel using my own ingenuity. Hey, ho, ho, what's this? I thought I had just quit my job! But here I was signing up for another job. I signed up to keep an eye on happiness-- what makes it, what breaks it, how it would affect our marriage, and how it would be affected by our marriage. Quite a job, indeed! It promised to be a lot of work with no paycheck and no career to build around the self-imposed task of "studying happiness." Now that I have been on this new job for almost fifteen years, it seems like a good time to take stock and get back to the venerable Mrs. Lakshmi with my findings; maybe she'll believe it this time around. But before I go on to the study of happiness, I will share with you the story of how Ehud and I found each other. 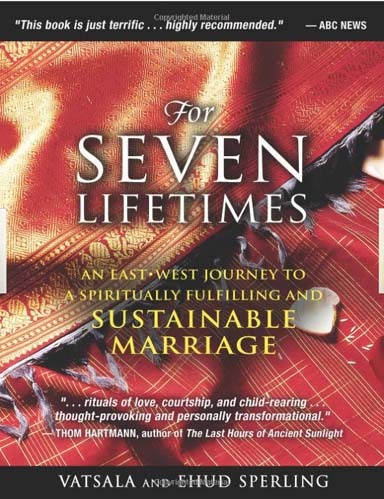 To order For Seven Liftetimes from Amazon.com, click here! Vatsala Sperling, Ph.D., fluent in a number of Indian languages and Sanskrit, learned these traditional stories at her mother's feet and enjoys introducing them to children of the Western world. Before marrying and moving to the United States, she was the chief of Clinical Microbiological Services at the largest children's hospital in India. She is the author of How Ganesh Got His Elephant Head, How Parvati Won the Heart of Shiva, Ram the Demon Slayer, Hanuman's Journey to the Medicine Mountain, Ganga: The River that Flows from Heaven to Earth, and Karna: The Greatest Archer in the World. She lives in Vermont with her husband and son. Ehud Sperling is founder and president of Inner Traditions International, one of the world's largest publishers of books on spirituality, religion, and alternative health. He lives in Vermont with his wife and son. *Excerpt from For Seven Lifetimes by Vatsala and Ehud Sperling C 2011 Inner Traditions. Reprinted with permission of the publisher Inner Traditions / Bear & Co.